Last year, the city of Sioux Falls officially made it legal to plant more than turf grass in your boulevard. But what does that mean? Boulevard, in this sense, means the strip of lawn between the sidewalk and the street. It’s also called the right-of-way, the parking strip, and the hell strip (we’ll get to why it’s called that soon). Boulevard seems to be the most-used term in Sioux Falls so we’ll stick with that one. The boulevard is actually owned by the city, but the property owner is required to maintain it. Why would you want to plant anything other than grass in the boulevard? In many locations, the boulevard is not easy to mow. Grass can also be difficult to grow there because of road chemicals, salt, and pollution. 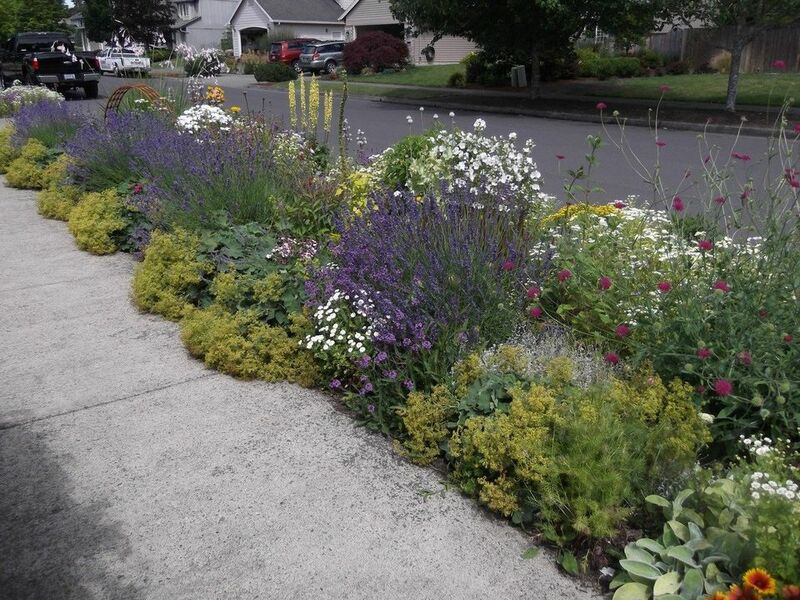 In addition, many landowners don’t want grass in their boulevards because they love gardening and want to use every inch of their property as an expression of beauty or art, or for yielding food, medicine, or flowers. Yet other landowners recognize lawns as resource-intensive and want to plant other plants that do not require mowing, watering, and treating. Our board member, Boyd McPeek, switched his boulevard from non-native plants to native plants in order to feed more native insects. He envisions “butterfly highways” created by a contiguous effort of neighbors throughout cities who plant native flowers in their boulevards. With strips of nectar-producing plants from one end of a city to another, monarchs and other migrating insects will have much needed energy boosts to make it through what otherwise might be a turf-grass desert. Now, if we could just keep those ditches from being mowed, they’d have food in the country too! What considerations do you need to make? The boulevard is often called a hell strip because it is an extremely inhospitable environment for plants. It is sandwiched between pavement, and an even larger strip of pavement so it gets a lot of heat from those surfaces. It’s flat, compacted land, usually, with no depression for water catchment, so often the heat exacerbates a lack of water in this area. It’s also battered with road chemicals, salt, pollution, and foot traffic. And don’t forget kids walk and ride their bikes by: they tend to veer off the walk now and then. They also tend to like to grab things and throw them (like tomatoes and apples). Pets are also walked by, and they tend to like to walk, dig, pee, and poop anywhere they please. The city also enforces some rules about what we can plant there. You cannot plant fruit or nut trees, as they will drop fruits on the road and sidewalks. You cannot plant anything taller than 3’ (or trees with a clearance lower than 10′ over the sidewalk and 12-16′ over the road) so drivers can see pedestrians and other drivers. You also cannot mulch with landscaping rock (seriously, don’t use that stuff anywhere) and other types of mulch are discouraged. No berms, keep plants trimmed off sidewalk and road, and keep fire hydrants open and accessible. We think these rules are deliberate and important rules and ask you to please follow them. You can read the exact regulations here: 96.010 PARKING STRIP LANDSCAPING. Also, please be a good steward and do not plant any invasive species. So do any plants fall into all those categories? Yes! Here in Sioux Falls, you have many options depending on how much shade you have and what your soil is like. Here are a few options for sunny areas. For many more options, check out this plant finder at Prairie Moon Nursery, a great nursery that provides only native plants and seeds. You can select your shade conditions and other preferences, just make sure you select plants only up to 3 feet tall and dry to dry-mesic soils. If you do not have trees in your boulevard, I recommend planting some shade trees which can provide shade to pedestrians, reduce city heat, increase your property values by hundreds to thousands of dollars, and provide all the regular life-sustaining functions of a tree. To kill turf grass, I normally recommend sheet mulching with cardboard or newspaper and wood mulch, but this isn’t recommended in the boulevard. Mulch tends to get kicked and washed onto sidewalks and roads and can cause problems. Roundup will kill any soil life that was left in the area and you’ll have an even more difficult time getting plants to grow there, so I highly discourage the use of weed-killer. Removing the grass with a sod cutter or shovel and tilling are your best options to get started. Since the city discourages mulch, plant the boulevard thickly with plants. 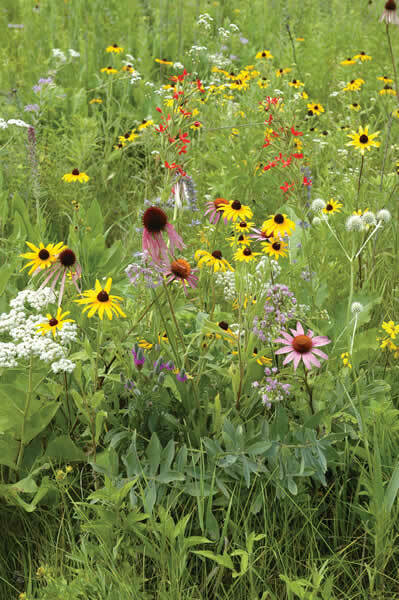 Prairie Moon, mentioned above, offers seed mixes that you can purchase and scatter over the soil in the fall (they usually need cold-moist stratification). When trees drop leaves on the boulevard, let them rest within the plants which will hold them in place. In the spring when the plants start growing again, chop the dead above-ground parts of the plants and lay them in place (yes, leave them standing all winter). The plants will quickly grow up between the gaps and hold the dead matter in place to decompose. This method will allow you to “fertilize” the plants with organic matter without having to use wood mulch or unnatural fertilizers. 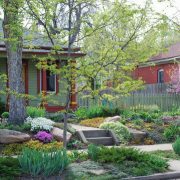 Regardless of which methods and plants you chose, we applaud you for reading this far into the article, which means you might be contemplating replacing resource-intensive lawn with self-sustaining plants in your boulevard. If you would like a more detailed plant list catered to your specific property, email us for more information on a consultation. Happy planting! Thank you for all the info you provided. 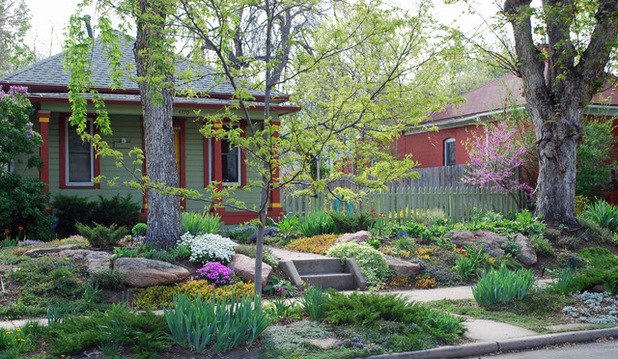 I’m so in favor of these gardens.